There's almost too much corporate news to keep track of this morning! It's time to block out the noise and focus on the key things you need to know before the opening bell rings in New York. 1. Tech giants stumble: Shares in Microsoft (MSFT) and Google parent company Alphabet (GOOGL) are dropping in premarket after both released quarterly results that disappointed Wall Street. Ultimately, Alphabet had a tremendous quarter and posted double-digit sales and profit growth. But results were held back by the strong U.S. dollar. The company said sales would have grown by six more percentage points had the dollar not been historically strong compared to foreign currencies. Meanwhile, Microsoft had a pretty lousy quarter as it faced higher taxes and took a hit from the stronger U.S. dollar. 2. Emissions problems tarnish auto sector: Shares in Mercedes-Benz parent company Daimler (DDAIY) are dropping by about 6% in Europe after the firm said it's investigating "possible indications of irregularities" in its process for certifying exhaust emissions in the U.S. The announcement is making investors nervous since it follows the huge scandal that engulfed Volkswagen (VLKAY) last year after it admitted to rigging diesel engine emissions tests in America and Europe. Meanwhile, shares in Mitsubishi Motors continued crashing on Friday in Japan -- down about 42% in three days -- after the company admitted to cheating on fuel economy tests. 3. Earnings: A whole load of companies are reporting earnings ahead of the opening bell, including McDonald's (MCD), American Airlines (AAL), Caterpillar (CAT) and General Electric (GE). 4. Stock market movers -- Sears, Aeropostale, AMD: Shares in Sears (SHLD) could jump at the open after the company announced it is shuttering 68 Kmart and 10 Sears stores across the U.S. The company is trying to accelerate the closure of unprofitable stores. Shares in Aeropostale (ARO)could continue to be under pressure Friday after Bloomberg reported that the struggling retailer is preparing to file for bankruptcy. Shares fell by 29% on Thursday. The company declined to comment on the issue to CNNMoney. The semiconductor firm Advanced Micro Devices (AMD) is set for a good day. The stock is shooting up by an astounding 18% premarket after the company forecast a bright future as it joined forces with the Chinese firm Tianjin Haiguang Advanced Technology Investment Co.
5. International market overview: U.S. stock futures are looking a tad soft on Friday while many European markets are dipping. Asian markets ended the week with mixed results. This follows lackluster trading in the U.S. on Thursday. 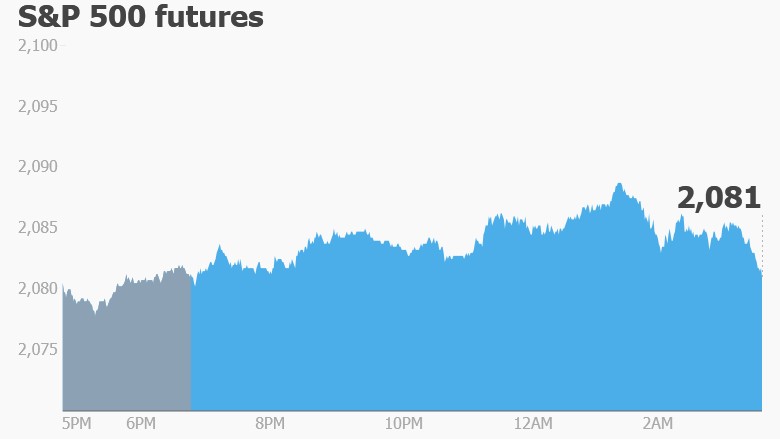 The Dow Jones industrial average stepped back by 0.6% and closed below the 18,000 mark. The S&P 500 dipped by 0.5% and the Nasdaq slipped 0.1%.